30 Second Wine Advisor: How old are old vines?  How old are old vines? Ancient vines are billed as a plus, but what exactly does "old vines" mean, and why are they supposed to be so good? Very good old-vines Zin, intense but not over-the-top, a fine example of the classic Zinfandel style. Columnist Donald Dibbern philosophizes about tasting language and numerical wine ratings; and we covered wines from "non-traditional" states on our our Internet Radio TalkShoe. In our WineLovers Forum, we're beating up on drinking wine through a straw, and the weekly CompuServe forum poll invites your thoughts on rating wines by points. Old vines, vieilles vignes or alte Reben: Ancient vines are billed as a plus, but what exactly does "old vines" mean, and why are they supposed to be so good? It is one of the generally accepted truths of wine appreciation that grapes grown on very old vines - gnarled and thick-trunked and deeply rooted - make exceptional wine. It might surprise you to learn, though, that there's no legal definition of the term. Producers are free to publish "old vines" on the label of any wine, with no penalty other than perhaps the scorn of consumers who catch on to cases of abuse. In general, many producers voluntarily limit the term to vines with at least 35 years of age, although this is by no means hard and fast. In California, where "old vines" most often attaches to truly ancient Zinfandel, Petite Sirah and other old classic varieties, it's not uncommon to see vine ages of 80 to 100 years or even older. In Australia, the Tahbilk winery still makes a Shiraz from vines planted in 1860; and Champagne's house of Bollinger boasts a tiny plot of pre-phylloxera vines dating back to the 1800s. At the other end of the time spectrum, the fruit from very young wines isn't considered ideal for top-notch wine, and in France and other European wine regions, wine laws typically forbid the use of grapes from vines before their third to fifth year. For the next two or three decades, vines are thought of as "adult" and their fruit may be used freely, although even then, many producers use only their older wines for the property's top wines, reserving the fruit of the young vines for less pricey "second labels." After 40 or 50 years, though, grape vines - like people, perhaps - start to slow down physically even as their "wisdom" grows. Very old vines produce relatively little fruit, to the point where growers - particularly corporate owners focused on the balance sheet - consider ripping out the under-performing old vines and replacing them with younger, more vigorous plants that will make more wine. What's more, the experts don't even fully agree on what mechanism enhances old-vines fruit. One widely accepted hypothesis holds that the roots of ancient vines have reached so deep (sometimes 30 feet or more) that they are unusually effective at contributing trace elements of terroir - the minerality of the soil - to the wine. Others suggest that the declining vitality of older vines simply reduces the yield of grapes, concentrating the vine's efforts into relatively few grapes of commensurately great flavor and intensity. 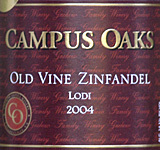 Today's featured wine, Gnekow 2004 "Campus Oaks" Lodi Old Vine Zinfandel from Gnekow Family Winery, offers a fine, affordable example of the genre. The back label speaks of 88-year-old vines; the winery Website indicates that it's sourced from four vineyards that average 90 years in age. Either way, they're certifiably ancient, and I'd rate the wine as a fine example of the old-vines style and a very good value. My tasting report is below. FOOD MATCH: Zin is always fine with steaks or burgers, particularly from the grill. Its forward fruit made it a fine match, too, with a meatless alternative, a hearty bowl of homemade macaroni and cheese with plenty of sharp Cheddar and a touch of Parmigiano Reggiano. VALUE: Mine came as a monthly club offering from California Wine Club, a longtime associate that consistently wins my applause for value from small, quality California producers. At retail prices in the low to middle teens, Gnekow Family Cellars wines in general, and Campus Oaks in particular, deliver good value. WHEN TO DRINK: Wine enthusiasts continue an ongoing debate about whether to enjoy Zin young and fresh or to cellar it for years and watch it mature into more subtle, Claret-like character. I'm in the "drink it young" camp, but that being said, there's still plenty of life left in this 2004.  Dibbern on Wine: When is a Toasted Buttered Apple Not an Apple? Strap in, dear reader. This month's column is a wild ride through philosophy, symbolism, linguistics, semantics, and surrealism. Oh, yeah, and how these relate to wine. Writer Donald Dibbern takes a philosophical look at wine ratings and reviews. A French firm is marketing wine to go ... with a straw! We think drinking wine through a straw is like drinking beer from the bottle: If you mainline your beverage in a way that bypasses your nose, you're wasting two-thirds of the experience. What do you think? Click to take part in this conversation in our online WineLovers Discussion Group.  Netscape/Compuserve Community Poll: How important are point ratings?